Samsung on Friday posted its earnings report for the fourth quarter of 2013, missing estimates and confirming the unaudited numbers it revealed a few weeks ago. The company reported record revenues of 59.28 trillion won ($54.95 billion), but operating profit was at 8.31 trillion won ($7.7 billion) for Q4 2013, an 18% dropped compared to the previous quarter when it reported 10.16 trillion won profit ($9.40 billion) – comparatively, the company reported 8.84 trillion ($8.18 billion) won operating profit for the same period in 2012. This was the first quarterly operating profit decline for Samsung in two years, even though overall it had a record year, with revenues at 228.69 trillion won, or a 14% increase from last year and operating profit at 36.79 trillion won for 2013, a 27% increase from 2012. Samsung’s mobile division was again responsible for more than half of the company’s revenue (33.89 trillion won) and profits (5.47 trillion won), although its mobile performance in Q4 was worse than the previous quarter by 9% and 18%, respectively. Even so, Samsung says its smartphone and tablets did well during the period, particularly highlighting strong tablet sales powered by the Galaxy Tab 3 and Galaxy Note 10.1 (2014 Edition) that were released in the previous quarter. However, “seasonal expenditures and a one-off expense” were responsible for the “slight” earnings fall during the period. According to Reuters, Samsung paid 800 billion during the quarter as a “special employee bonus to commemorate 20 years since Chairman Lee Kun-hee announced a management strategy that the company regards as the catalyst to its recent growth.” Furthermore, an extra 700 billion won was “knocked off” by a stronger won. The full earnings press release follows below. SEOUL–(Korea Newswire) January 24, 2014 — Samsung Electronics Co., Ltd. today announced revenues of 59.28 trillion Korean won on a consolidated basis for the fourth quarter ended December 31, 2013, which is an increase of 0.3 percent quarter-on-quarter. For the quarter, the company posted consolidated operating profits of 8.31 trillion won, representing an 18-percent decline Q-o-Q. Consolidated net profit for the quarter was 7.30 trillion won. In its earnings guidance disclosed on January 7, Samsung estimated fourth quarter consolidated revenues would reach approximately 59 trillion won with consolidated operating profit of approximately 8.3 trillion won. 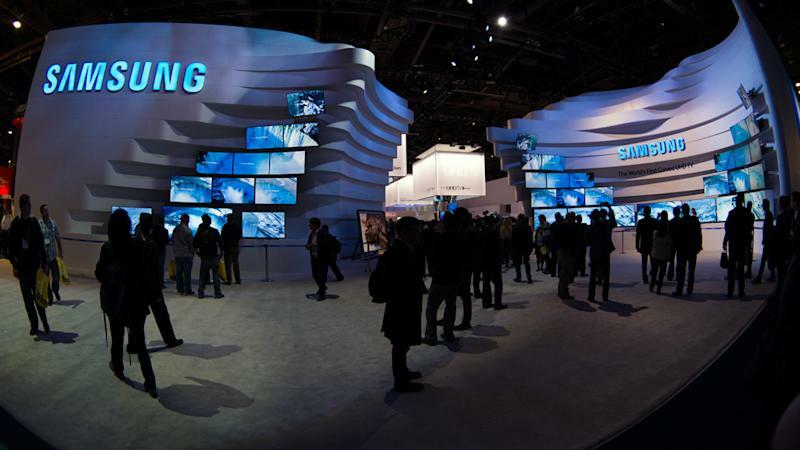 The fourth quarter results brought Samsung’s full year 2013 revenue to an all-time high of 228.69 trillion won, up 14 percent from the previous year. Year-end net income registered 30.47 trillion won and Samsung netted 36.79 trillion won in operating profit, a 27-percent on-year increase. In 2013, Samsung maintained its market leadership in mobile devices as evidenced by its smartphone market shares of over 30-percent for both developed and emerging markets, and a two-fold surge in tablet sales from the previous year due to the release of new products such as GALAXY Tab 3 and GALAXY Note 10.1 (2014 Edition). The solid performance is also the result of our efforts to strengthen customer touch-points with shop-in-shop experiences. As for TV shipments, Samsung saw robust growth in developed markets in the quarter thanks to premium products that boosted growth by 90 percent from the July-September quarter. Orders for 60-inch and larger TVs recorded 80-percent growth while demand for Smart TVs grew by more than 60 percent in the fourth quarter. Profit margins for Digital Appliances Business remained steady in the quarter led by increased sales of premium products in developed markets. On the components’ side, inventory adjustments and a retreat in panel price took their toll on the Display Panel segment’s overall earnings but increased shipments of IT and UHD TV panels were a silver lining. For the Memory business, revenue in the fourth quarter landed in positive territory with cutting-edge process and high-margin DRAM and NAND Flash memory chip products. “Amid macroeconomic uncertainties such as a strong Korean won and increased concerns over possible quantitative easing (QE) tapering in the U.S., our earnings were lower than what the market expected due to a negative currency impact of around 700 billion won and a significant one-off expense of about 800 billion won, however, fourth quarter operational results were respectably strong. Looking at the quarterly earnings trend, we expect 2014 to follow last year’s pattern of a weak first half and a strong second half as usual,” said Robert Yi, Senior Vice President and Head of Investor Relations. For the first quarter, it will be challenging for Samsung to improve its earnings in the first quarter as the weak seasonality of the IT industry will put pressure on demand for components and TV products. Looking into this year, in finished products, Samsung is looking to maintain its leadership in the smartphone business by leveraging its expanded product portfolio across diverse regional markets and price points. Samsung is looking to increase its business footprint in the wearable device category with innovative products such as GALAXY Gear and it will ramp up its tablet lineup with mid- to low-end models and larger screens. Driven by high value-added premium products including UHD, curved and 60-inch and over TVs, Samsung is confident it will outperform the market. This year looks more promising due to the upcoming world soccer championship in Brazil and the anticipated expansion of the UHD TV market. On the components’ side, we will secure profitability in the semiconductor market with high-margin, state-of-the-art memory processes, diverse product offerings and the production of V-NAND. Samsung will try to stay ahead of the race in logic chips or System LSI with 20-nanometer-class AP and by solidifying growth potential by migrating to the 14-nanometer-class process. We anticipate increased orders of large LCD panels this year as we look forward to stronger demand for high-end TVs that are curved or feature UHD resolution. Meanwhile, Samsung plans to use OLED panels in products other than smartphones which will further our profit margins. Capital expenditure in fiscal year 2013 totaled 23.8 trillion won, which was in line with our previously announced spending plan. For the Semiconductor Business, Samsung executed 12.6 trillion won and 5.5 trillion won was injected for upgrades in the Display Panel segment. Specifically, investments were made in LCD panel fabrication facilities and in capacity expansion for OLED panels. Process migration to the 20-nanometer-class process for DRAM and System LSI and improvements to NAND chip production plants took up the bulk of this year’s capex. Total capex for this year will be similar to the level of 2013. The Board of Directors approved a year-end dividend of 13,800 won per share. The total dividend paid out for 2013 is 14,300 won per share, which is about 1-percent of the average share price in 2013 and a 79-percent increase from the year earlier. Following a comprehensive review, Samsung aims to increase total shareholder returns proportionate to the yearly free cash flow (FCF), compared with 2013. Samsung’s Semiconductor businesses – including Memory and System LSI – posted 1.99 trillion won in operating profits for the quarter on 10.44 trillion won in consolidated revenue. The memory chip business claimed the bulk of sales with 6.52 trillion won in revenue, a 2-percent increase in gains quarter-on-quarter. The chip business enhanced cost competitiveness by expanding low-power and high-performance DRAMs based on the 20-nanometer-class process. As for NAND, the 10-nanometer-class portion increased while profit was enhanced through sales expansion of solution products, including SSD. As for System LSI, while overall demand for high-end mobile components was lower than expected, fourth quarter revenue slightly increased compared to the third quarter led by increased AP shipments for new products. Heading into 2014, while memory market supply is expected to remain tight, given limited investments by major players, the company will expand cutting-edge processes and increase the proportion of high value-added products in the product mix to maximize profitability. For System LSI, the company expects to improve profitability by introducing 20-nanometer-class mobile AP and strengthening high-value LSI product lineups such as high pixel CIS. In addition, we will prepare for future growth by successfully migrating towards 14-nanometer-class. The IT & Mobile Communications (IM) division – consisting of Mobile Communications and Networks – posted operating profits of 5.47 trillion won on 33.89 trillion won in revenue for the December quarter. Out of the total IM earnings, the mobile business was responsible for 32.17 trillion won. The earnings of the Mobile Communications Business fell slightly compared to the previous quarter due to seasonally increased marketing expenditures and a one-off expense. Meanwhile, tablet shipments rose sharply on strong sales of GALAXY Tab 3 and GALAXY Note 10.1 (2014 Edition), released during the end of the third quarter. In 2014, Samsung will focus on expanding its smartphone portfolio both by region and price range, and actively responding to growing LTE demand in Europe and China. In terms of our product mix, smartphone shipments will account for over 70 percent of total mobile phone shipments. For tablets, the market is expected to increase by more than 20 percent from the previous year and Samsung aims to continue solid sales momentum through larger display devices and innovations in user convenience. Samsung will secure solid profitability by pursuing innovation in retail channels such as new Experience Shops, pursuing stronger cost efficiency and actively cultivating B2B market sales, through its enterprise security solution KNOX. The Display Panel segment recorded an operating profit of 110 billion won in the fourth quarter on revenue of 6.46 trillion won. This represented declines in sales and profit compared with the previous quarter. Despite strong seasonality, the overall LCD market was impacted by a decline in average selling price for TV panels due to weaker demand from manufacturers making inventory adjustments in an oversupplied market. Accordingly, Samsung’s TV panel shipments decreased on-quarter in the low single-digit percentage range, although shipments were higher than the corresponding quarter of the previous year. Depreciation costs from LCD fab operations in China affected the panel business’ profit for the quarter. For IT panels, growth momentum continued into the quarter for both the market and Samsung with increased demand for tablet panels as manufacturers prepared new products for the year-end peak season. Market demand for laptop and monitor panels remained weak. Looking ahead to 2014, the company expects to secure profitability in TV panels by increasing sales of premium products, including over 60-inch and curved panels, as well as expanding its entry-level lineups. The company also aims to capitalize on the stronger demand for TV panels in 2014 that is expected due to major global sporting events and deeper UHD market penetration. For OLED panels, Samsung will focus on expanding the market into a broader range of products, including mass-market smartphones, tablets and wearable devices, in order to achieve sustainable revenue growth. Furthermore, the company plans to achieve mass production of higher-quality flexible panels to further widen its technological gap over competitors. The Consumer Electronics division – encompassing the Visual Display and Digital Appliances businesses – posted an operating profit of 660 billion won which was an 88-percent increase on the previous quarter. Revenue was 14.27 trillion won, an increase of 18 percent quarter-on-quarter. The Visual Display Business accounted for 10.07 trillion won of sales, led by increased premium TV sales. Lifted by peak season sales in the fourth quarter, the TV market experienced stronger demand with high growth in the over 60-inch TV segment and increased shipments in developed markets. Samsung outperformed the market in the quarter through successful seasonal promotions, helping it to improve performance both on-quarter and on-year. With strong quarterly growth in premium product sales, such as Smart TVs and over 60-inch TVs, the company was also able to improve margins. Heading into 2014 and expected world soccer championship -focused promotions and UHD TV market expansion, we plan to outperform the market by increasing sales of high value-added premium TV products, such as UHD, curved, and large-size over 60-inch TVs. Additionally, the company will actively respond to diverse regional market conditions with entry-level LED TVs and region-specific products. For home appliances, Samsung posted slight on-quarter growth due to year-end promotions and increased sales of premium products in the U.S. and Europe as demand began to pick up in developed markets. Looking ahead, although sluggish growth in emerging markets is expected, Samsung will target on-year growth in 2014 thanks to economic recovery in advanced markets where it will focus on launching innovative products including its premium Chef Collection lineup. To improve profitability, region-specific models will be expanded and the company will pursue greater efficiency in operations.